Three brindle pointed ricolor welsh corgi cardigan puppies are looking for the new homes! We have 2 boys and 1 girl! Puppies were born on the 26th of September. Father - our Alastor, mother - our Ada! Look for the photos of the puppies and their pedigree on the litter's page! Our congratulations to the owners of our Matiss (Zamok Svyatogo Angela Luka) with this debute! Brindle welsh corgi cardigan boy Mario is looking for the new home! The daughter of our Frida - Margarita has her own page on our website now! There are new photos on the page of the daughter of our Avva — welsh corgi cardigan Fanta! Our welsh corgi cardigan puppies are 64 days now! Look at their new photos! 5 of them are still looking for the new homes! Our welsh corgi cardigan puppies are 50 days now and they are looking for the new homes! Look at the new photos of our cardigan-kids! The puppies of our Frida are 1 month yet! Look at their photos and pedigree on the page of the litter! In the beginning of the summer there was "big photo-session" in our Kennel and now we want to show new photos of our welsh corgi cardigans! We made the webpages for our new welsh corgi cardigan puppies! Look the photos and pedigree of Natan (Rodwell Flash Of Fire) and Bob (Rodwell Pure Energy)! We have 2 very good news! First - we are very happy to introduce our new cardigan-boys who have come to us from welsh corgi cardigan kennel RODWELL (New Zealand) owned by Mrs Bridget Smeeton, who worked with the breed for more than 50 years now! Meet red Natan (Rodwell Flash Of Fire) and tricolor Bob (Rodwell Pure Energy)! We are very happy and thank the breeder for such beautiful and strong pups! And thanx to Dorota Paz who helped our puppies to make such a long way to our home! We will make the personal pages on website for them and show their new photos as soon as we can! As soon as our puppies will grow up, we will show their photos. Look at the new photos of our welsh corgi cardigans Frida, Alastor, Ada and Oskar! Meet our new cardigans - Dusya (DEAR DABRIA Controversia) and Odin (DANCING DINO Controversia)! Brindle girl and boy of welsh corgi cardigan from friendly to us Kennel Controversia (Poland) are looking for the new homes. Parents are: CYPRIAN Corlan Gi and Big-Wood's DO CONTROVERSIA. Let us introduce our new welsh corgi pembroke, daughters of our Meggie - little Sofie and little Rozie! There are puppies of welsh corgi cardigan in friendly to us Kennel Controversia (Poland). 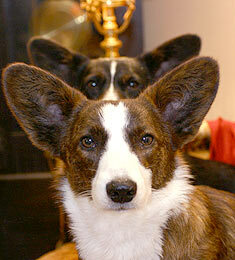 The welsh corgi cardigan puppies of our Avva and Uszaki BIG BEAT (Poland) are growing and now they are 2 nonths old! Look for their photos and pedigree on the page of the litter. Our congratulations to our puppies with exellent showing on welsh corgi speciality under judging of Fran Fricker (KERMAN Kennel (GB)! Big thanx to their owners! On the 26th of March our welsh corgi cardigan Avva gifted us two beautiful puppies - brindle girl and boy! Father of the puppies - JCH POl, POL CW'07, SZ JCW'07 Uszaki BIG BEAT (Poland). Puppies are growing and soon we'll show their first photos! Our congratulation to owners of welsh corgi cardigan Fanta - she became Junior Champion of Russia! And there are new photos from Euroasia dog-show on Fanta's page! There are new photos on the welsh corgi cardigan Fanta's and welsh-corgi cardigan Perchi's pages (here and here). Our congratulations to welsh corgi cardigans Zamok Svyatogo Angela Imperator и Zamok Svyatogo Angela Infanta with first and succesful participation in Euroasia International dog-show! There are new photos on our welsh corgi cardigan Avva's page! There are new photos of our welsh corgi cardigan Fanta and welsh corgi cardigan Klepa on their pages. Also, the page of welsh cjorgi cardigan Zamok Svyatogo Angela Imperator (Perchi) was added to website.